All eyes in Andhra Pradesh are on the by-elections to the May 8 Kadapa Lok Sabha and Pulivendula assembly constituencies, from where Jagan Mohan Reddy and his mother Vijayalaxmi will be contesting. There are a lot of permutations and combinations that are already being worked out and each one has on his mind what would be the fate of the all powerful Congress after the elections. A few days ago, there were whispers that Jagan would align himself with the Bharatiya Janata Party in Andhra Pradesh and would try and form the next government. It was also said that he would use his proximity with Gali Janardhan Reddy, the mining lord and BJP minister from Karnataka, and form the government with the BJP in Andhra Pradesh. The other crucial question, however, is the stand Jagan would take regarding the controversial Telangana issue. But he did not mention the 'T' word even once during his yatra, which could be an indication that he might stay clear of this particular issue. Then there were more rumours that he might join hands with the Telangana Rastriya Samithi in the near future, but his supporters say it is highly unlikely. However, an association with the BJP is not a possibility, according to Jagan himself. He has made it clear that there would be no such alliance whatsoever, and he would be forming the government alone in Andhra Pradesh. A party insider, however, said the only possibility of an alliance would be with the Communist Party of India-Marxist, since Jagan considers it to be the only secular party. However, insiders refuse to reveal too much about his future plans and say that things would begin to take shape only after the elections. They added that he and his mother are aiming for nothing short of a landslide victory. This is very crucial for Jagan since his future course would depend on the number of members of legislative assembly he manages to lure over from the Congress. Currently he claims to have the open support of 30 Congress MLAs. 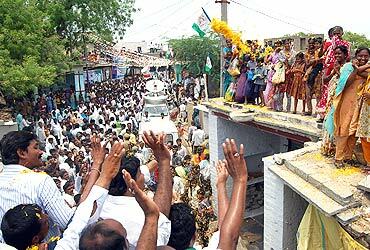 Meanwhile, the campaigning in Kadapa is hectic. It looks like a family affair, with his wife and sister also joining the campaign. All through the campaign, the entire family has only been speaking about the "betrayal by the Congress". They have even termed it as a war between Sonia Gandhi and his father's commitment to the people of Andhra Pradesh. 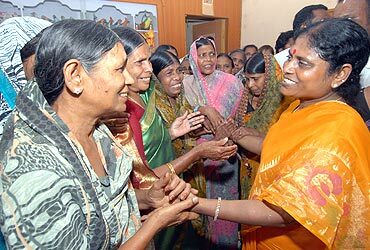 However, Jagan's fiercest campaigner is former Congress minister Konda Surekha. Her mantra is simple: she says that Andhra Pradesh has been flooded with the ill-gotten money earned by the Congress. "Take note from the Congress and give vote to the YSR Congress Party," she tells the voters. She also points out that this election will change the dynamics within the Congress. As a result, the Congress has fielded namesakes of both Jagan and Vijalaxmi in order to confuse the voter. Another person who is expected to join the Jagan bandwagon soon, is Congress member of Parliament Sabbam Hari, who has decided to snap ties with his party. When asked about prospects of the Congress following these by-elections, he said, "Get ready for mid-term elections after this." "The Congress will diminish after these elections and many members from the party will join Jagan. 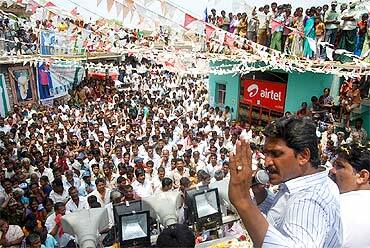 I have no doubt that both Jagan and his mother will be voted in with a huge majority," he said. "The road ahead has a lot of problems for the Congress and these elections will be the turning point. I wish to play a bigger role in state politics with the YSR Congress party," he added. 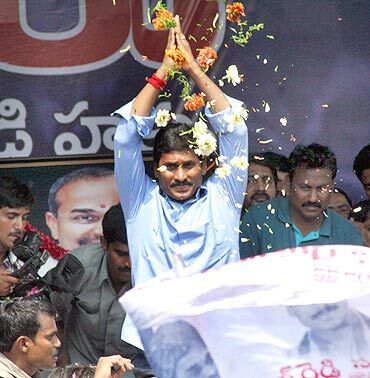 The mood in the Jagan camp at the moment is upbeat and they say their time has finally come. "We are taking one step at a time and it is a matter of months before we have a full-fledged party. Currently Jagan has only released his party's flag. The constitution and by-laws of the party will be released immediately after these elections. A symbol would be on its way by April 21," a party member revealed.